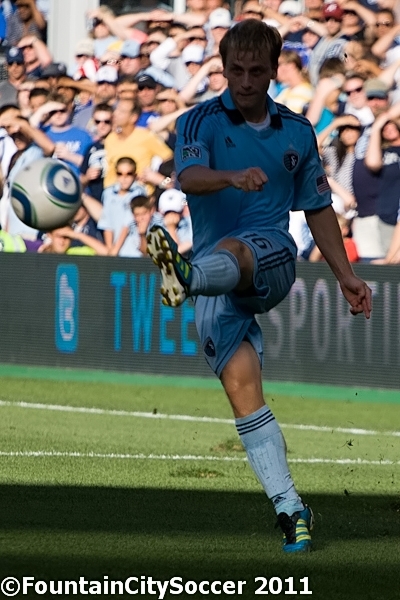 Not that anyone in the stadium was surprised, but the referees impacted another Sporting KC match at LIVESTRONG Sporting Park. 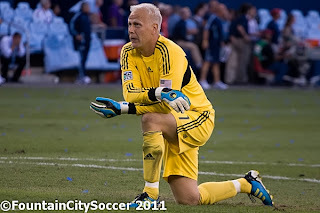 Referee Ricardo Salazar, linesmen Brian Poeschel and Peter Manikowski made several questionable calls. 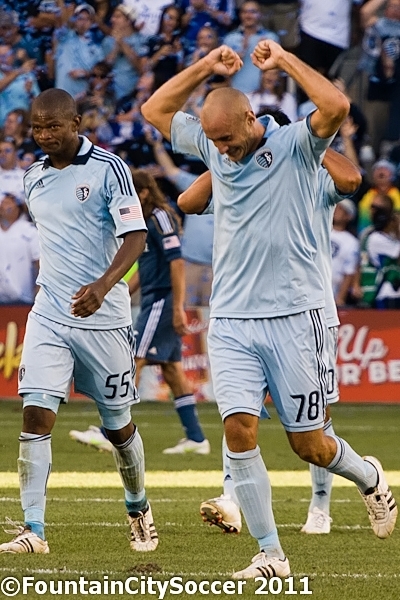 It's hard to pick the one that had the most impact on the game, either the linesman allowing Sean Franklin's first goal in the 25th minute which appeared to be offside, or the 2nd half goal by Aurelien Collin being disallowed, even though it doesn't seem possible that Collin was offside. Omar Bravo was in an offside position, but the officials told manager Peter Vermes that the goal was disallowed for Collin being offside. 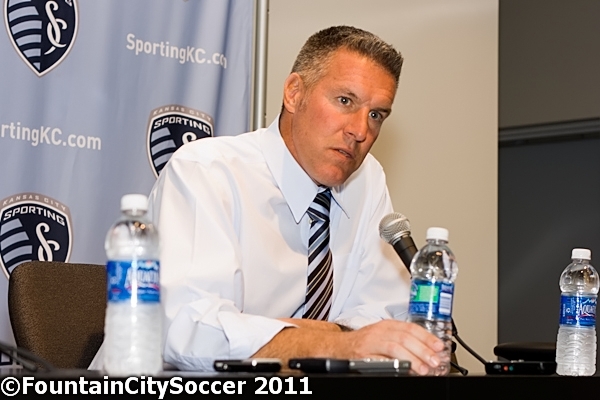 Vermes called taking away a world class goal like that was unacceptable, and I agree with him. Having seen several replay angles, there's no way that goal should have been disallowed. Speaking of Collin, it was good to see him, Davy Arnaud and Jeferson on the field again. They seemed to be a bit rusty, but that's understandable, considering how long they were out (in the case of Davy, especially). Vermes said they were lacking rhythm in the game and that was one reason Davy came on late, but Davy played well, putting several balls into the box and making a general nuisance of himself. One other thing about the officials: Before tonight, when was the last time that Landon Donovan and David Beckham were both booked in the same game? 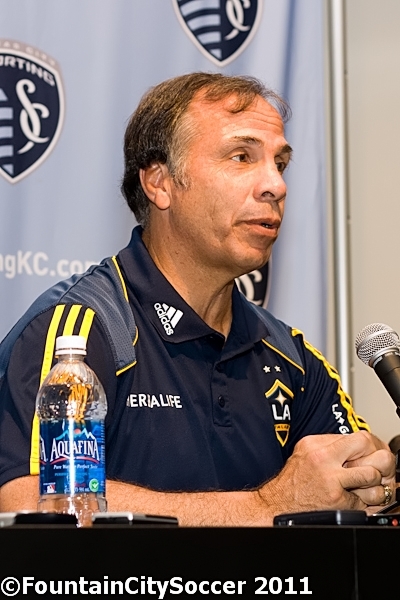 I'm sure Ricardo Salazar will be hearing from the commissioner about that. *rolls his eyes* The only thing that refs in this league need to be hearing is that they need to either get better, quickly, or look for another line of work. The quality of the officiating, as I've said before, is holding MLS back in its quest to become one of the premier leagues in the world. I wouldn't go so far as to say the officiating in the English Premier League is perfect, but it's certainly light years ahead of MLS and one reason it's widely regarded as the best league in the world.